As of today, it is officially winter in southern New England, though we wouldn't know that by the weather. It feels like we never made it past mid-November. My best stretch of fishing happened in mid-December. With temperatures in the 60s, I didn't even wear a jacket. I never would have predicted that. Like the last two autumns, 2015 was another low water season. It hardly rained at all. 2013 was low, but it was a dream compared to 2014. This year made 2014 look somewhat desirable. Every year, we seem to get less rain when we need it the most. Despite the shockingly low water, I noticed a big difference between this fall and last fall. In my experience, the 2014 fish were extremely skittish and fussy. Fall 2014 was the toughest season I've experienced in years. At the beginning of this fall, I expected the fishing to mimic last fall. It wound up being better than 2014. It wasn't the blockbuster season 2013 was, but I'd say it was about average in terms of productivity. The salmon were definitely more aggressive this year than they were last year. They didn't seem to be as put off by the low water. They were bigger, too. I didn't land any real whoppers, but caught a handful of fish in the 8+ lb. class. I hooked more salmon in fall 2015 than in I did in fall 2014 to spring 2015 and in far fewer trips. I had a couple trips with no action at all, but very few without at least a hookup. With the water being so low, the fish didn't have much opportunity to move around. As a result, I caught fish in fewer pools than normal. That was a drag, as I wasn't able to fish some of my favorite pools when they were in prime condition. Case in point...one of my clients texted me two mornings after a rain. He said he was fishing that morning and asked where he should go. I looked at the USGS site and the river was at 250 cfs and it would be clear by then. There is a pool that is dynamite at that level, as close to a "sure bet" as you can get. I told him where to go and he landed two salmon in an hour. It is one of my favorite pools, but I never had a chance to fish it under the right conditions. I didn't even get to guide it at that level. The drought was bad enough the river wouldn't stay at a good level for that pool for more than half a day. So, I fished most of the same old places, day in and day out. They were very reliable, which was great, but it would have been nice to have a change of scenery every once in a while. Low, clear water made small flies a good choice in the early season. I fished a fair amount in October and did well. 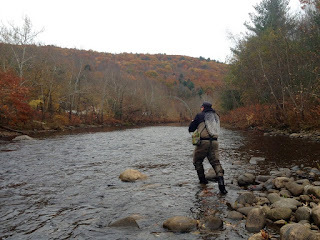 November was full of guide trips and I barely fished at all. My clients caught salmon on most trips though, so I was very happy about that. After a wave of guiding and heavy music work wrapped up in early December, I was back out there again. It took me a second to get my bearings back, but I was on it in no time. The end of the fall was terrific fishing. Throughout spring, summer, and fall of 2015, I barely used a two handed rod. I used the two handers less than I have in any season since I started with them back in 2010. There just wasn't the water for it, even throughout most of the spring. A couple of opportunities presented themselves this fall, but almost all of my October and November fishing was with my 9' 7wt. rod. A couple of my clients had an opportunity to fish with their two handed rods. I have been using an 11'9" 7wt. switch rod most of December, mainly because I have been fishing some of the larger pools and I can get away with using it. A single handed rod would probably be fine though. Overall, it wasn't a great season for two handed rods. With the single hander, I used a floating line and mono leader throughout all of October and November. I caught a couple fish with a switch rod and Scandi/floating polyleader setup. Most of my two handed fish have come (in December) on a floating/intermediate Scandi head with a slow sinking polyleader. 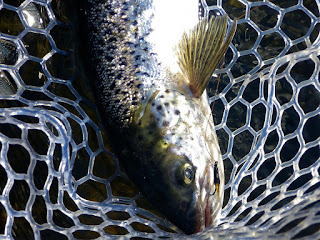 The goal wasn't to sink the fly to the stones as much as it was to hover the fly just above the heads of the salmon. I did have a couple of guide trips where we fished right after a good rain. A floating Scandi head and a 7.0 its Versileader did the trick. The Catch-A-Me-Lodge caught my largest salmon this fall. 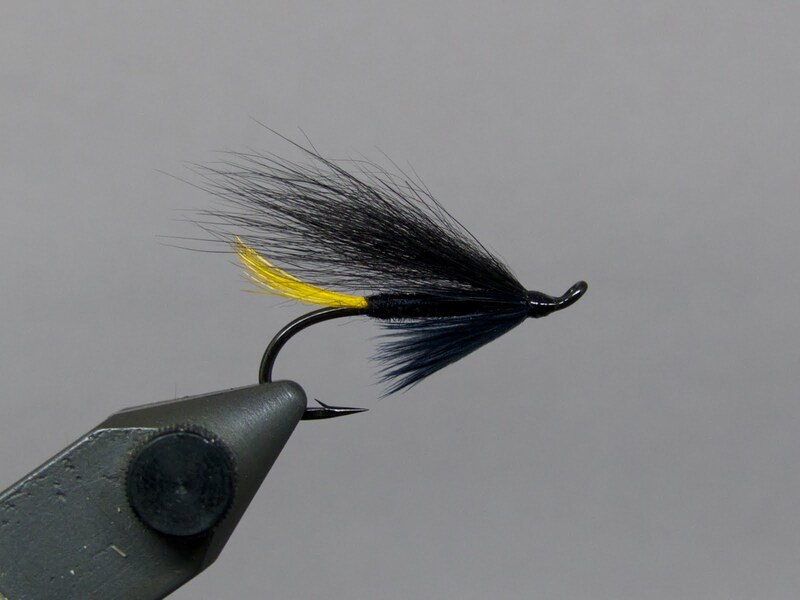 As far as flies go, I didn't rely on my previous favorites that much this season. I don't know why. I found that my "B list" flies, ones that I am not without, but aren't in my top five, were the right ones for the job. I only caught one salmon each on the Same Thing Murray and the Mickey Finn. I had one pull on a Sugerman Shrimp, but didn't hook anything with one. I didn't move anything on a Green Machine or a Snaelda which, along with the Sugerman, tied for best fly last season. I had no hookups with any sort of Sunray Shadow, though I moved a couple of fish with a hitched Sunray. Ally's Shrimp, Almost, Grizzly Bug, Split Wing Bomber (green/brown), Golden Shrimp (brass bottle tube), Same Thing Murray, Mickey Finn, Picasse, Undertaker (plastic tube), Catch-A-Me-Lodge, and the Grape (aluminum tube). The Catch-A-Me-Lodge was responsible for catching my largest salmon of the season. In order, my top three producers were the Almost (6 salmon), Picasse (4 salmon), and the Grape (3 salmon). In terms of numbers, the Almost came out on top for me this fall. If I factored in flies that were effective while I was guiding, the Mickey Finn would come out on top of all, even the Almost. That is no surprise. It's in the running for top fly pretty much every year. It just caught a lot more fish for my clients than it did for me. 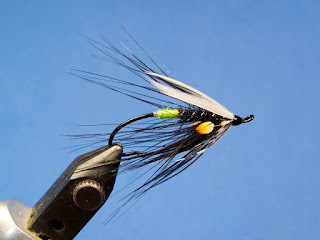 The other flies that were winners with my clients were the Green Machine, Gray Ghost, and the Dirty Water Dog. Most of my guide trips fell during a period of time when the salmon were all over Mickey Finns, so the vast majority were caught on them. Like the Almost, the Grizzly bug is both simple and deadly. Without a doubt, the highlight of my season was a day in October which brought two salmon to hand on dry flies. This was the first time I've ever caught more than one in a day on dries. Prior to that day, I had two other occasions this season where salmon came up to nail a dry fly. One of the two felt the hook, got spooked, and never came back. The other one was ultimately caught on a wet fly. 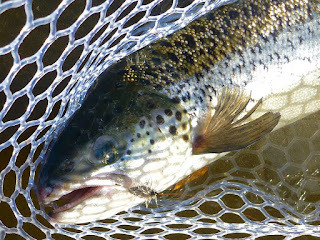 I'd love to use the dry fly more often, but it is too inefficient for searching water. 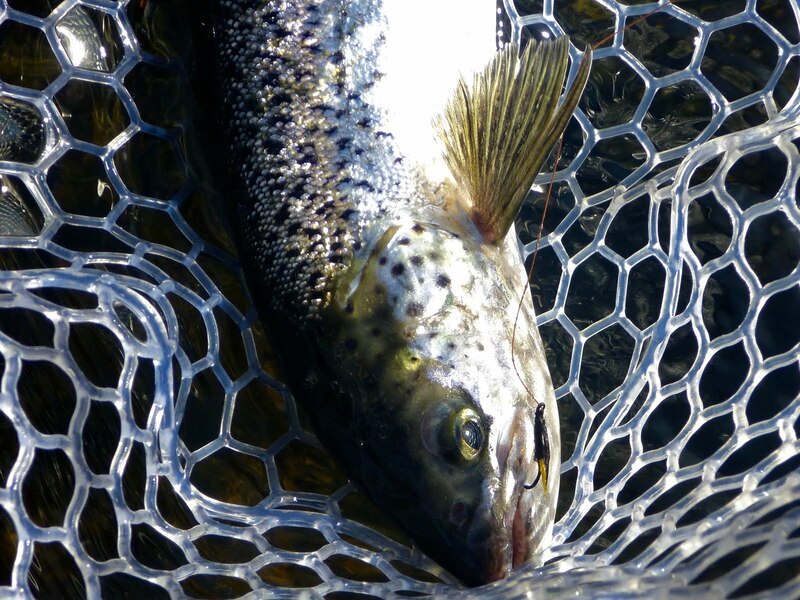 When fishing for a specific salmon or a known lie in low water, dries can be very effective and they are always exciting. The dry fly that produced the lion's share of the action for me this season was the Grizzly Bug. I am eager to start tying flies for 2016. I need to replenish my stock of shad flies for next spring. Also, I need to tie flies for a salmon fishing trip to the Grand Cascapedia and Bonaventure rivers next June. 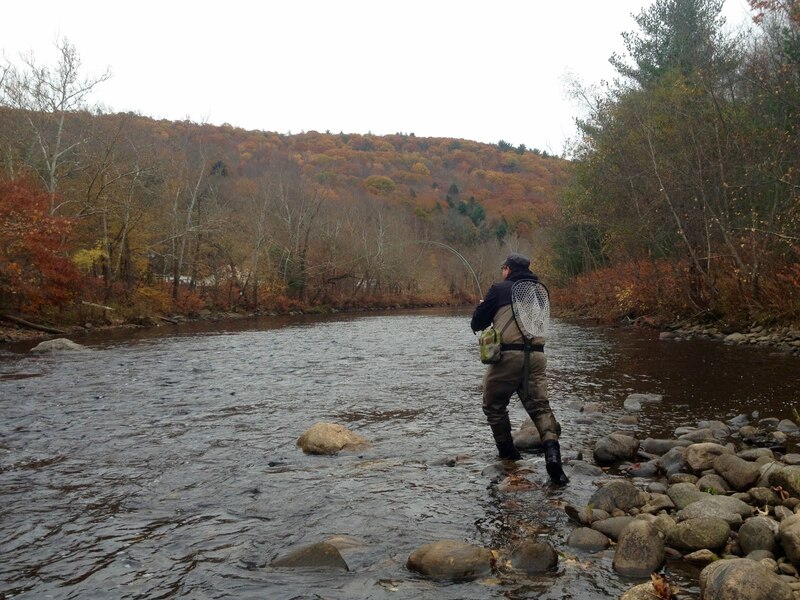 Until the weather catches up with the calendar, however, I'm going to keep fishing the Naugatuck. The past two brutal winters have been virtually impossible to fish. This year might be a different story. I'll keep you posted. As always, thanks for reading! Considering the flows that is a pretty good season. Better than mine for sure... one trip and no fish. Having an extra long (ongoing) November helped. Don't feel badly about getting skunked in only one trip. That's pretty common, especially if you're unfamiliar with which pools fish best under certain conditions. Great summary of the season, although its not over yet! With all the rain we just got it might just be time for the switch rod and tube flies again! I'm gonna take my dad out tomorrow actually. Who would have thought salmon fishing on christmas!? It's definitely not over yet. This was just a summary of the fall part of the season. Winter wasn't fishable last year. This year it definitely will be. Good luck tomorrow!